Start with this program first--it is our best introduction to Scripture memory! 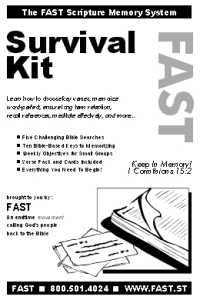 In the Survival Kit, you will learn how to hide Scripture in your heart, and keep it there, effectively! This simple but powerful course gives you everything you need to get started: five brief Bible Search booklets, each with weekly objectives, a verse pack, blank cards, and our ten keys to memorizing--all drawn straight from the Bible!